"We know fans of Ultimate Team want more ways to play, more items, more content, and exciting events that deliver big in-game rewards"
COLOGNE, Germany--(BUSINESS WIRE)--Electronic Arts Inc. (NASDAQ: EA) today released an all-new gameplay trailer showcasing many of the new kits, transfers, celebrations, skill moves, newly-modeled players, and innovative gameplay features in EA SPORTS™ FIFA 17, powered by Frostbite ™* on Xbox One, PlayStation 4, and PC. 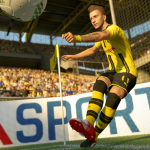 Celebrating the real-world return of several licensed football leagues from FIFA 17, the trailer, captured in-game, highlights true-to-life action powered by the industry-leading new game engine, putting fans in control of every moment on the pitch when it launches on September 27th in North America and September 29th worldwide. Watch Football, Powered by Frostbite: here. Part of the biggest season yet in Ultimate Team™, FIFA 17 introduces two new ways to play within the franchise’s most popular mode with Squad Building Challenges and FUT Champions. Squad Building Challenges gives fans the opportunity to test their management skills on console or in the FUT 17 companion app, and earn in-game rewards by fulfilling squad requirements with players from their Club. Once the requirements are met, fans can exchange squads in each challenge to redeem rewards. FUT Champions* is a new way for all fans to compete in daily knockout tournaments for in-game rewards and the chance to play in the Weekend League. Once fans make the Weekend League, they will compete to win matches and rank up for rewards. Each Weekend League performance counts, as combined wins help fans rank up the Monthly Leaderboard for the chance to earn the biggest in-game rewards in FUT. Reaching the top spots on the Leaderboard could result in an opportunity to compete in the EA SPORTS FIFA 17 Ultimate Team Championship Series** – part of a new competitive gaming platform in FIFA 17 which gives eligible fans a chance to compete*** at the highest level and their share of a $1.3 million USD prize pool. FIFA Ultimate Team Dynamic Live Service means fans can expect compelling content throughout the season, like fresh new kits and items, chances for big in-game rewards, and more reasons to play than ever before. That starts just after launch with Ones to Watch – a new event in FUT 17 featuring some of this summer’s most notable transfers as season-long, dynamic items. Attributes of Ones to Watch player items increase if the real-world player is named to the Team of the Week, so FUT fans will want to find players who they expect to make an impact at their new club. More on FIFA Ultimate Team: here. Career Mode* ups its authenticity by innovating on the Financial System to reflect the structure of teams around the world by including your Club Worth, and a detailed breakdown of income and expenses. The stakes are higher in FIFA 17 Career Mode because fans are now expected to meet objectives of their board in Total Club Management, a system based on the team’s personality which sets expectations in five categories: Domestic Success, Continental Success, Brand Exposure, Financial, Youth Development. More on Career Mode: here. Pro Clubs* introduces a new Player Growth System which delivers a comprehensive new way to develop your player by rewarding teamwork and co-operation based on your match rating. The mode also brings a new level of customization to fans’ Clubs with 24 kit and crest templates that fans can design into their own identity. More on Pro Clubs: here. Launching this Fall on iOS, Android, and Windows 10, FIFA Mobile is an all-new football experience built with features for players who love playing on-the-go and interacting with other fans. Features like Attack Mode give fans quick and exciting turn-based matches focused on attacking chances one half per turn. Leagues allow fans to join people around the world to compete in inter-league championships, earn cooperative achievements, or compete against other leagues online. More on FIFA Mobile: here. For FIFA 17 assets visit: info.ea.com. Fans who pre-order FIFA 17 Super Deluxe Edition can get up to 40 FIFA Ultimate Team Jumbo Premium Gold Packs, Team of the Week loan players, and other FUT content. Click here to read about all our available pre-order offers. EA Access**** members on Xbox One and Origin Access**** members on PC can try FIFA 17 before it’s released with a Play First Trial starting September 22nd. EA Access members receive a 10 percent discount when they purchase a digital version of the game on Xbox Live, and Origin Access members get a 10 percent discount when they purchase the game through Origin. FIFA 17 is developed by EA Vancouver and EA Romania and will be available in North America on September 27th and worldwide on September 29th on Origin™ for PC, Xbox One the all-in-one games and entertainment system from Microsoft, PlayStation®4 computer entertainment system, Xbox 360® games and entertainment system and PlayStation®3 entertainment system. *FROSTBITE GAME ENGINE TECHNOLOGY, PRO CLUBS, THE JOURNEY, FUT CHAMPIONS, AND SOME FEATURES IN CAREER MODE, ARE AVAILABLE ON XBOX ONE, PLAYSTATION 4 AND PC PLATFORM VERSIONS ONLY. **QUALIFICATION FOR THE EA SPORTS1 FIFA 17 ULTIMATE TEAM1 CHAMPIONSHIP SERIES AND THE FIFA INTERACTIVE WORLD CUP IS ONLY AVAILABLE TO ELIGIBLE PLAYERS ON XBOX ONE AND PLAYSTATION 4. NO OTHER PLATFORMS AND CONSOLES ARE SUPPORTED FOR QUALIFICATION. ***RESIDENCE IN ELIGIBLE COUNTRIES REQUIRED. FINAL TERMS AND STRUCTURE SUBJECT TO CHANGE. ****CONDITIONS, LIMITATIONS AND EXCLUSIONS APPLY. SEE EA.COM/EAACCESS/TERMS AND HTTP://WWW.ORIGIN.COM/STORE/ORIGIN-ACCESS FOR DETAILS. 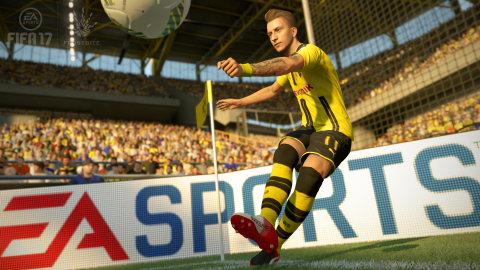 Join the EA SPORTS FIFA community at Facebook and on Instagram. Follow us on Twitter @easportsfifa and use the hashtag #FIFA17. The game is rated E for Everyone by the ESRB. EA, EA SPORTS, Origin, Frostbite, The Sims, Dragon Age, Plants vs. Zombies, Ultimate Team, and Battlefield are trademarks of Electronic Arts Inc. and its subsidiaries. John Madden, NFL, PGA TOUR, NHL, NBA, UFC and FIFA are the property of their respective owners and used with permission.